Guys. 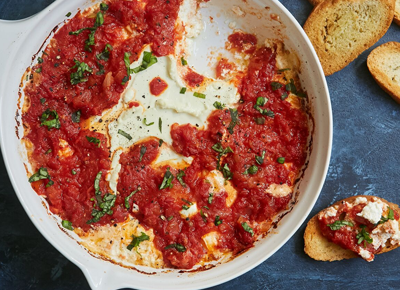 We've found the greatest party appetizer ever: baked gorgonzola bites. All you need is five ingredients and 30 minutes to make this melty, cheesy, pull-apart recipe. It's basically a savory monkey bread, and you won't be able to stop snacking. 1. Preheat the oven to 375°F. Grease a 9-inch oven-safe round baking dish (such as a cake pan, skillet or casserole dish) with nonstick cooking spray. 2. Divide the dough into 20 even pieces, and roll each piece into a ball. Transfer the dough balls to a large bowl and add the melted butter. Toss to coat the dough fully in the butter. 3. Arrange the dough into concentric circles in the prepared baking dish. Pour any butter that’s left in the bowl over the dough. 4. Sprinkle the gorgonzola over the dough balls, and bake until the dough is golden brown, 18 to 20 minutes. 5. Serve warm, garnished with parsley and black pepper.